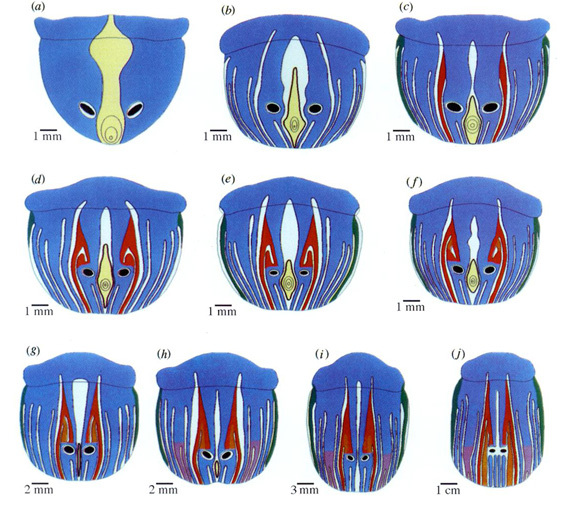 Electroreceptor development patterns are as equally perplexing as the platypus's appearance! 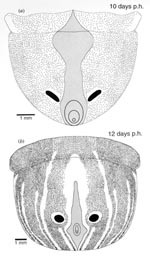 Mucous electroreceptors found on platypuses is innervated in order to structurally accommodate electroreception and transferring stimulus to the central nervous system. 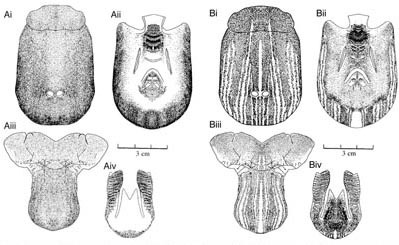 They form parasagittal stripes along the upper and lower surfaces of the bill, which has been attributed to the directionality of the electroreceptive response (Figure 1). 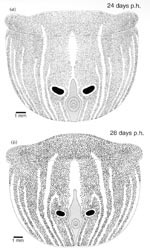 This striated appearance has been found to change throughout development (Manger et al. 1998). Figure 1. Distribution of receptors relevant to electroreception in an adult platypus. Pores are evident the 10 day mark after hatching and are initially distributed evenly throughout the bill surface. By 12 days, a striped appearance begins to take shape. By this point, two kinds of pores are distinguishable based on size. The larger pore is presumed to be the precursor to the mucous receptor. Another 12 days later, the amount of mucous receptors increases and the progression towards the striated appearance found on adults ensues until 28 days p.h. (Figure 2.; Manager et al. 1998). Figure 2. Distribution of electroreceptors from 10 days to 28 days p.h. Despite the fact that upon hatching, platypuses are equipped with fully developed mucous glands, sensory innervation has no effect on behavior until six weeks post hatching (p.h.). Furthermore, the push-rod mechanoreceptor and serous electroreceptors do not appear until 28 days p.h (Manager et al. 1998). This alteration at 28 days p.h. is correlated with a sudden reduction in mucous electroreceptors and drastic change in bill morphology. 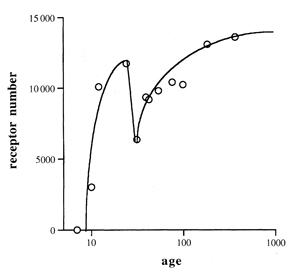 The course of bill development from birth to adult is shown in Figure 3.